They all love The Man Juke. Kinny, the singer from the Kinny & Horne project with Espen Horne is here. TM Juke has crafted some "Damn" nice pop for the lady, she'd be stupid to refuse those kind of advances. Sinous Brighton vocalist Sophie Faricy, who toured as lead singer with TM Juke, but also sings for Bushy (Catskills), Bonobo (Ninja Tune) and many more, hasn't missed the party either, gracing the amazing broken latino groover "Come Away" with a counterpointing cool vocal part. Danish singer Naim -a newcomer on the scene with a new 7 inch out on Today Records (if anyone's got info on that?? )- is here too, with one of the hightlights of the album: "Skin", and its wonderful electronic pop harmonies on a classic hip hop beat. Don't miss the 12 inch featuring a rap from Rup (Zebra Traffic) out in March 2007... and not only for this track, but also for the following one on the album, "So Good", featuring the incredible vocals of Alice Russell, the explosive new UK soul singer! After TM Juke had produced such a beautiful album for her, she couldn't not be part of the game. This record's just starting to sound like a collection of hit songs, when you get to "Life, Rain, Fall", sung by Jim Oxborrow, a masterpiece of anti-"Blade Runner" futuristic soul - a favorite played on the new "Block Party Vol.2" mix by Paris DJs. 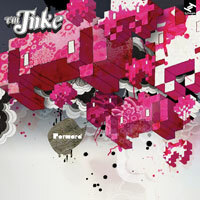 TM Juke has clearly been digging for vocal parts, and he's been really good at it, considering this is already is second album of 2006 (with Alice Russell's one, the second in a row to appear in the djouls.com biannual selection), and with the new ones coming in 2007, we can already say the man's now became a complete scene by himself! Stepping out with the album he's always wanted to make 27 year old Al Cowan, aka TM Juke, is firmly pushing 'Forward'. It's his first album released domestically by Ubiquity, and second as TM Juke for Tru Thoughts. He has also produced the Alice Russell albums and more remixes than you can shake a stick at. This album almost didn't happen. In fact it wasn't for a sudden change of heart it would have sounded completely different. "Last year I was finishing off a load of tracks, then I just threw it all away and started again. It just didn't feel right and I thought it wasn't good enough. The only track I kept was "Grounded in Fargo" (which happened to me on the way to California last year)," says Cowan. "I made this album in about only 3 months. It was burst here and there, then nothing for a week, as I was touring with Alice Russell and moving house! I had to set my computer up in a few random locations!" he adds. Expertly combining the benefits of a comprehensive musical education with his reactionary love of laptop-based music, Cowan has quickly established himself as a prodigious UK songwriter and arranger. He's a broadminded and captivating DJ and an exceptionally talented producer, and a full-blown member of the Tru Thoughts stable. He plays bass, guitar, sampler and some keys on 'Forward'. He also enlisted some great UK talent behind the mic, including long-time collaborator Alice Russell and up and coming UK act Elmore Judd. In addition there's a host of previously unknown vocalists. "I've always thought that it is good to try and bring fairly unknown, if not completely unknown, talents to the table because you are far more likely to find a more original and interesting sound," he says. "For instance, Naim, the guy that features on 'Skin' (in case you thought it was a girl, most people do) is an old friend of mine. He just started sing a few years ago, and his voice sounds super crazy. There were four of us in my old bedroom, (where I recorded the whole album (about 8ftx8ft!)) and we we're in complete hysterics throughout the whole recording process after a real heavy night out. We were just trying to come up with some real disjointed lyrics about girls in clubs, and were just packed around the mic coming up with lines etc. Then I listen back with a bit of a clearer head and thought - That's it, I love it!" As a child, Cowan was schooled in both classical and jazz guitar theory before he began tinkering with samplers. This was a rebellious act calculated to annoy his father, who had forced him to attend formal music lessons from the tender age of seven. This formal education has left an indelible mark on much of this young producer's work. Seamlessly blending the dexterity and verbosity of traditional jazz with the cut 'n' paste sensibilities of hip hop, TM Juke's productions resonate with crisp beats, earthy instrumentation and spellbinding arrangements. "Forward is where I want to go, I feel like it's the album I have wanted to make," says Cowan. "It's really been a natural step from my first to the 'My Favourite Letters' album with Alice which taught me a lot. And now 'Forward'. If you listen to those 3 albums in order I think it makes sense." I've been waiting so long to hear anything new from TM JUKE, and now this suuuper bomb! This thing could go BIG, real BIG if it's marketed right. I mean "damn ft. Kinny" could just blow up like Gnarls' crazy, and it's a lot better, too! !